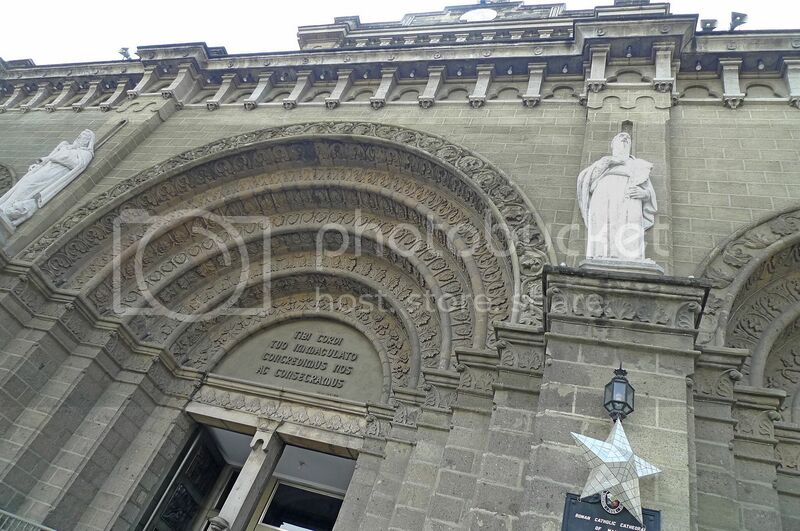 On my second day in Manila, I went to the historical walled city of Intramuros. 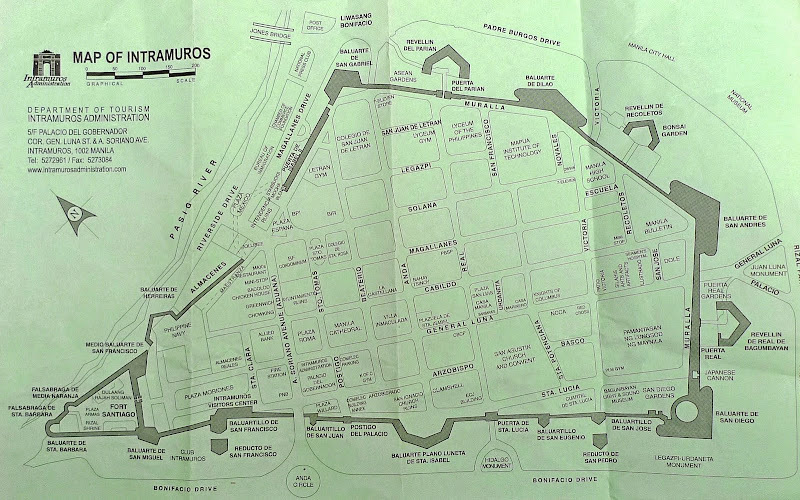 Located at the southern bank of Pasig River and just north of Rizal Park, Intramuros is the oldest district in the city of Manila. 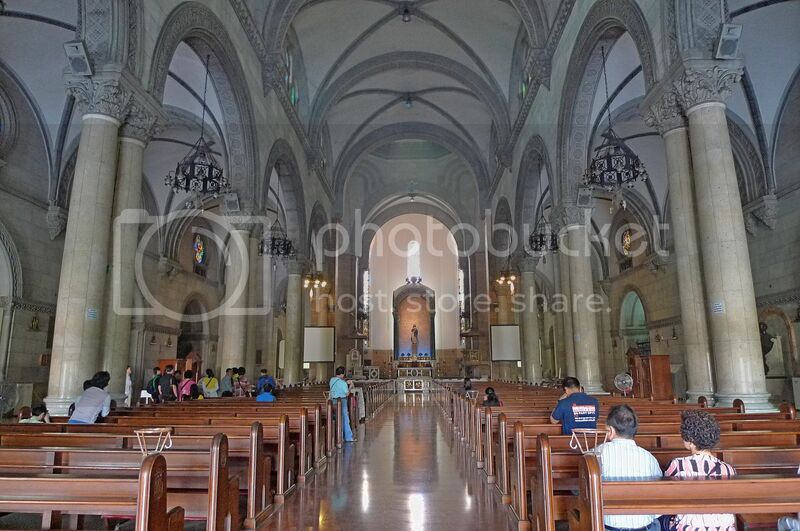 It was built by the Spaniards in the 16th century and as such, you can see Spanish architecture and influences there. In fact, the word Intramuros means 'within the walls' in Spanish. This fits the description of Intramuros well as it is surrounded by high thick walls and moats. The taxi driver drove past Rizal Park on Roxas Boulevard and entered Intramuros from Bonifacio Drive. I don't know why but I just love the name of the roads in Manila! 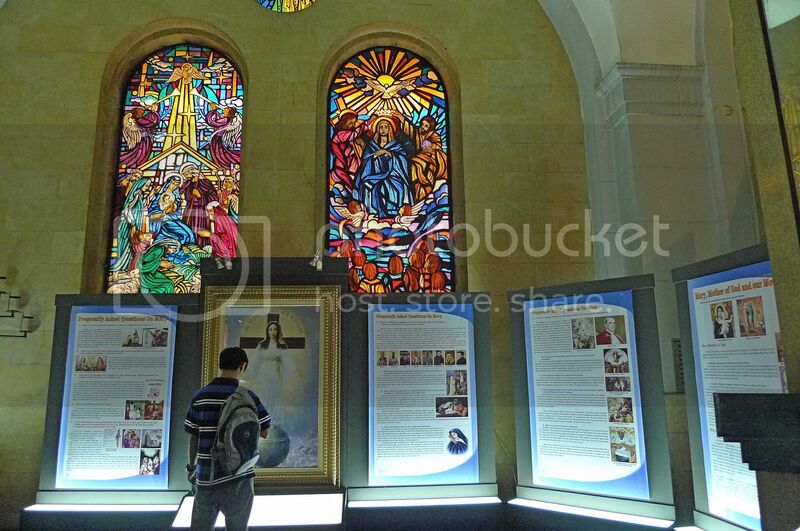 There were a lot of places of interests to visit inside the walled city of Intramuros. 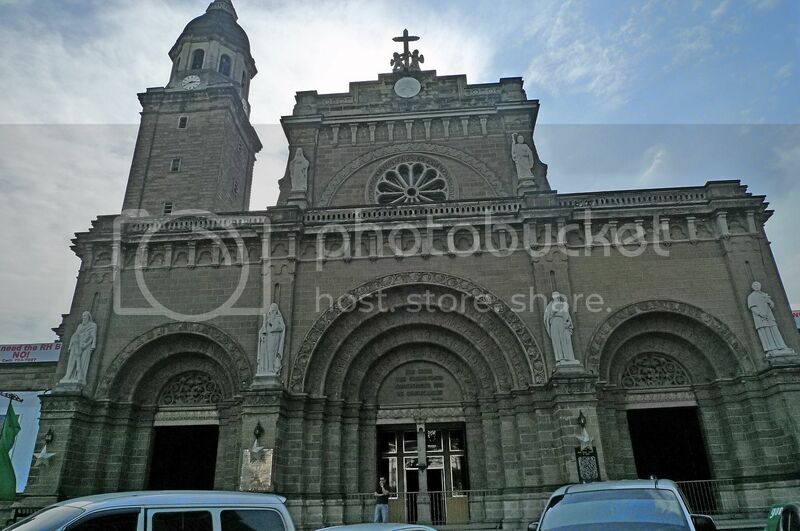 But the driver stopped me right in front of the Manila Cathedral. 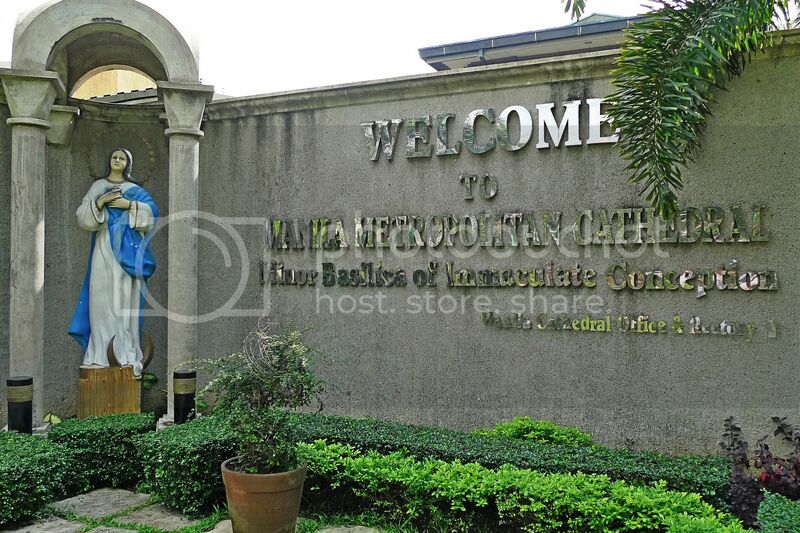 It is located not very far from the entrance into Intramuros (if you are going in from Bonifacio Drive) and just opposite Plaza Roma. 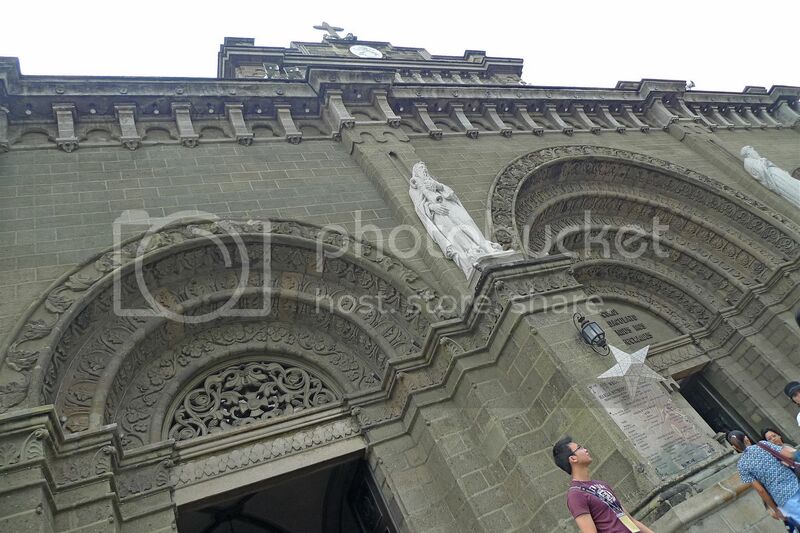 I decided to make the Manila Cathedral as the starting point of my tour of Intramuros. 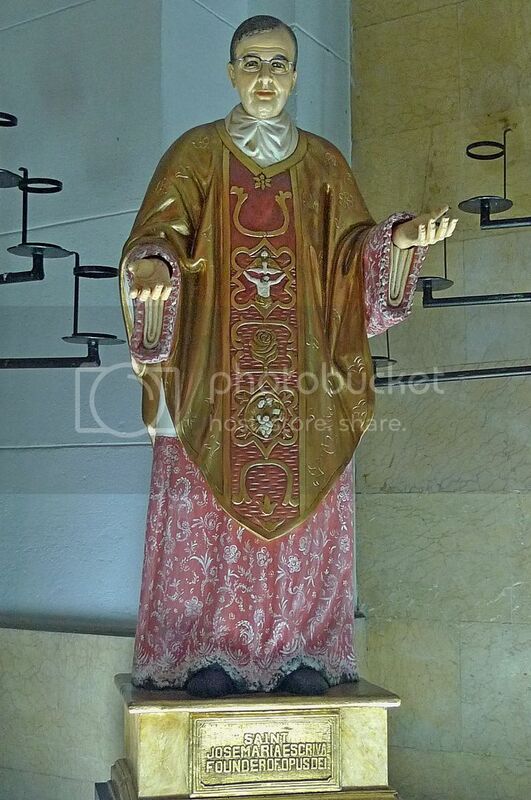 The main facade of the cathedral is graced by statues of famous saints sculpted in Roman travertine stone. 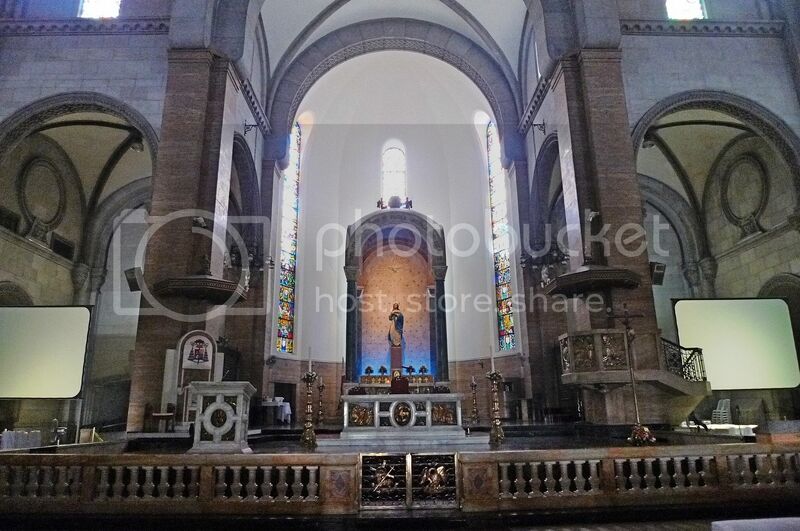 Also known as the Cathedral-Basilica of The Immaculate Conception, the Manila Cathedral is the cathedral church of the Roman Catholic Archdiocese of Manila. 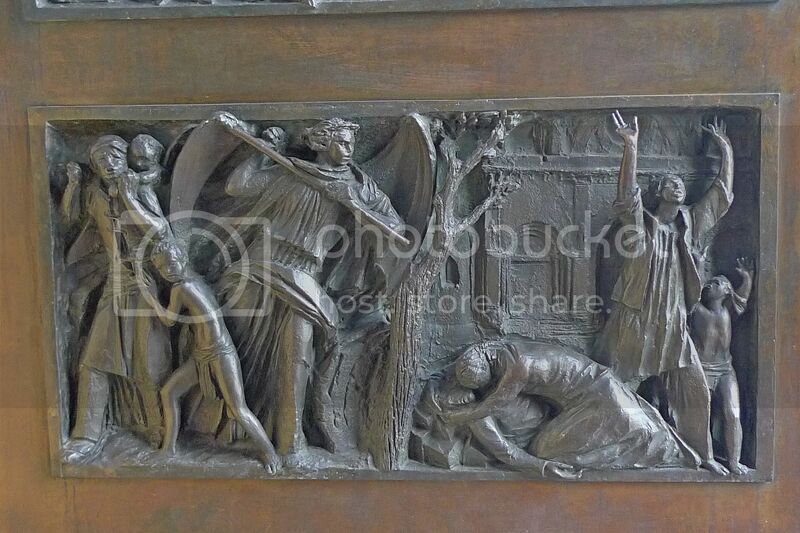 I like the tympanum designs above the main door. 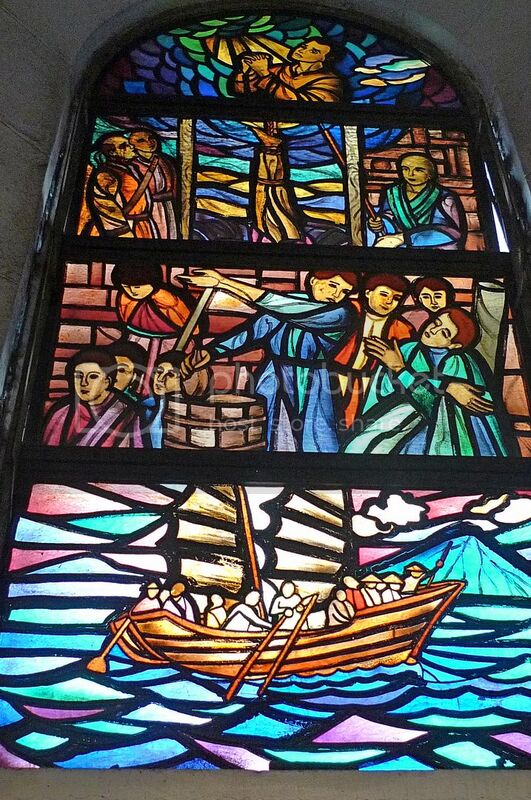 Amazingly, this cathedral has been damaged and destroyed several times by typhoon, fire, earthquakes and World War II since the original cathedral was built in 1581. 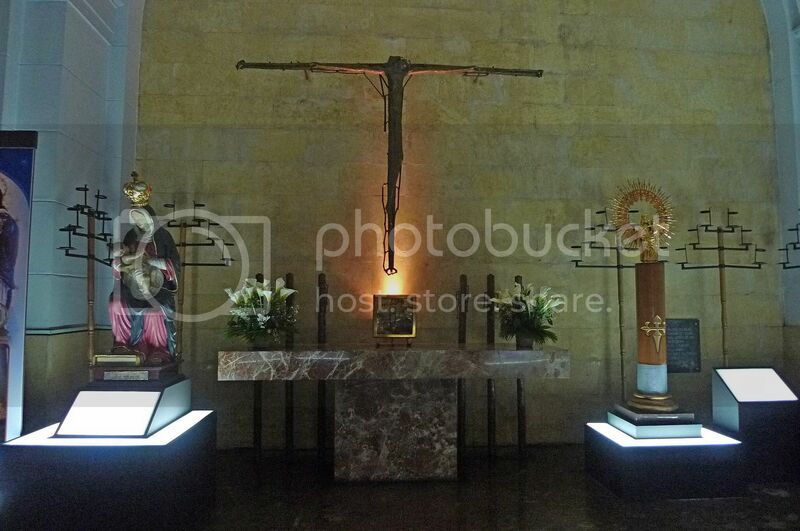 The present structure, which is the sixth, was completed in 1958 and was consecrated as a minor basilica in 1981. 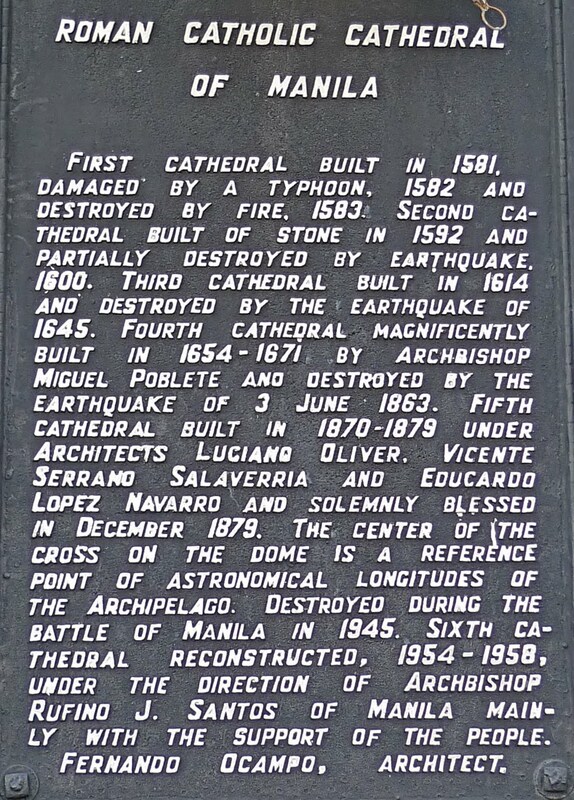 However, according to the Manila Cathedral's official website, the present cathedral is actually the eighth. Now I am confused! 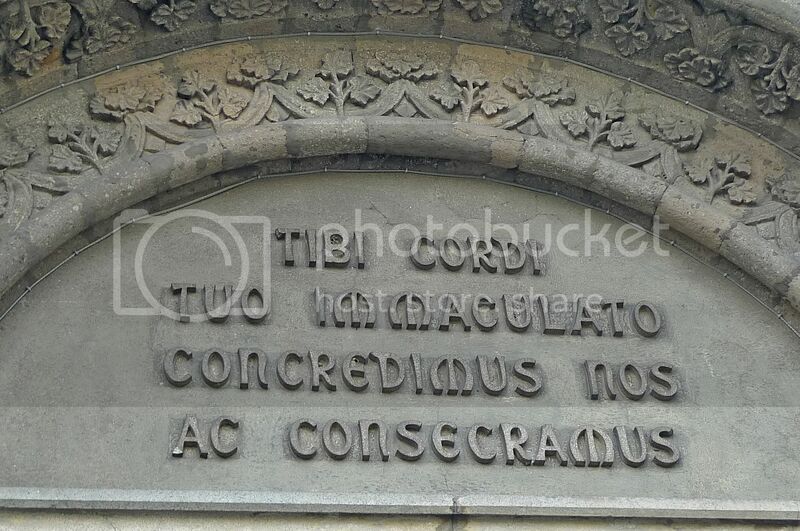 If it is true that this is the eighth cathedral, then that means the marker placed on the facade is giving the wrong information! 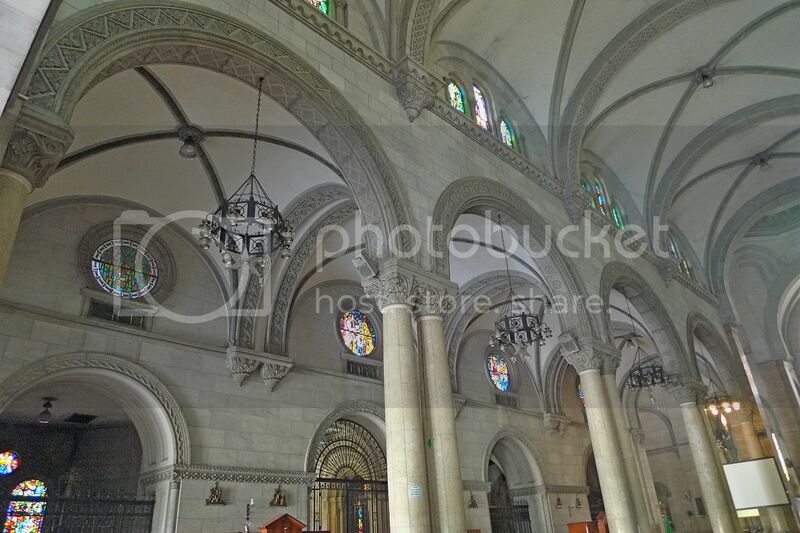 Entering the cathedral, I was immediately taken in by the interior of the central nave. 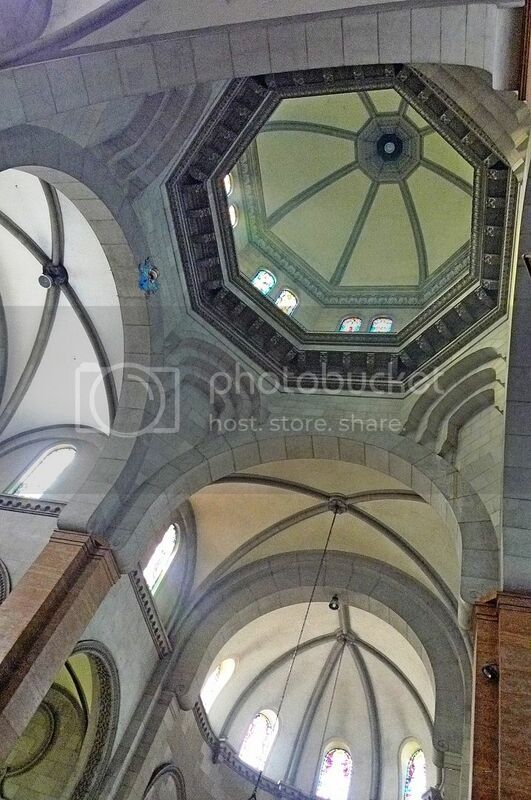 I took a few shots of the walls and ceilings. 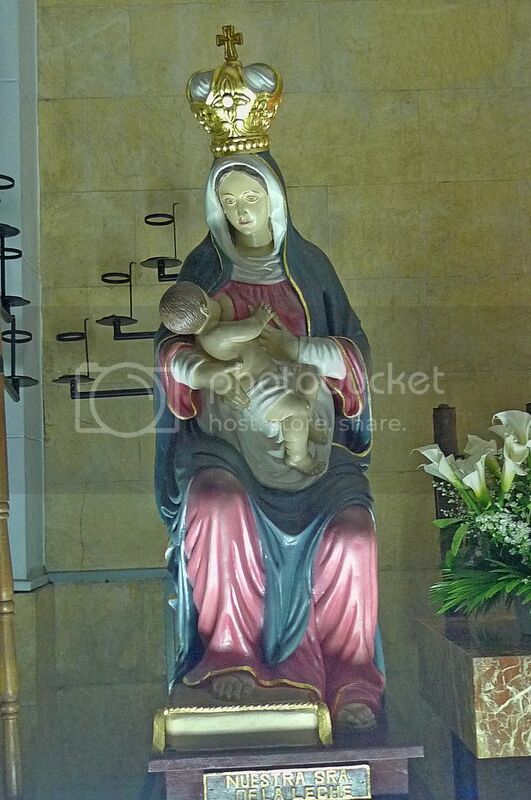 Can you see the confession box in the picture below? 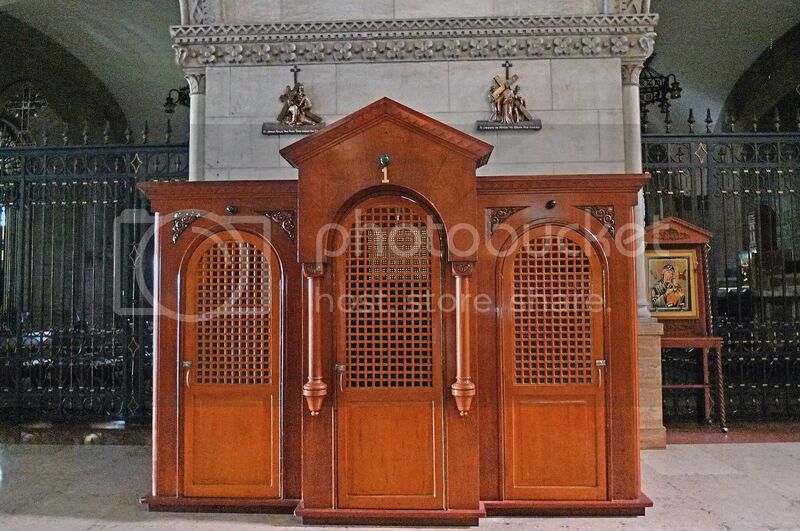 Here's a close up shot of the confession box. Have you been inside one? 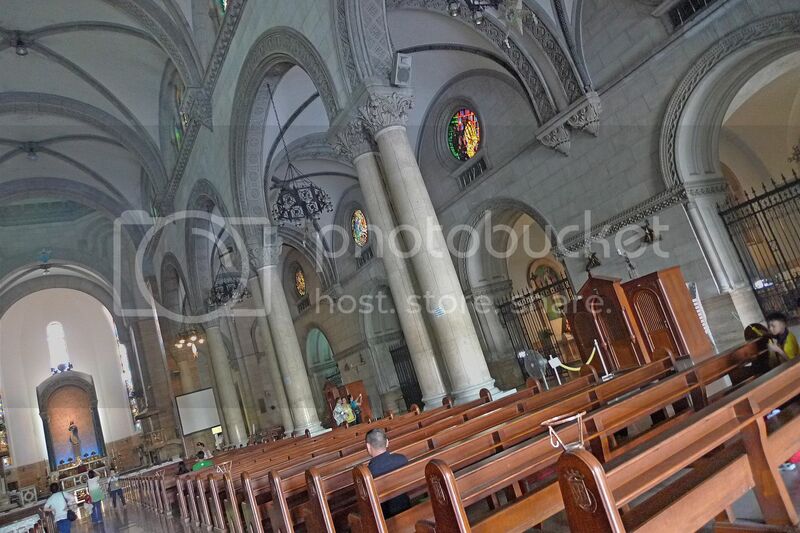 Walking towards the front passing the rows and rows of benches, I reached the main altar. The Manila Cathedral had hosted the funerals of two former Presidents of the Philippines, namely Carlos P. Garcia, the 8th President of the Philippines in 1961 and Corazon Aquino, the 11th President of the Philippines (and the mother of the current Philippine President Benigno "Noynoy" Aquino III) in 2009. 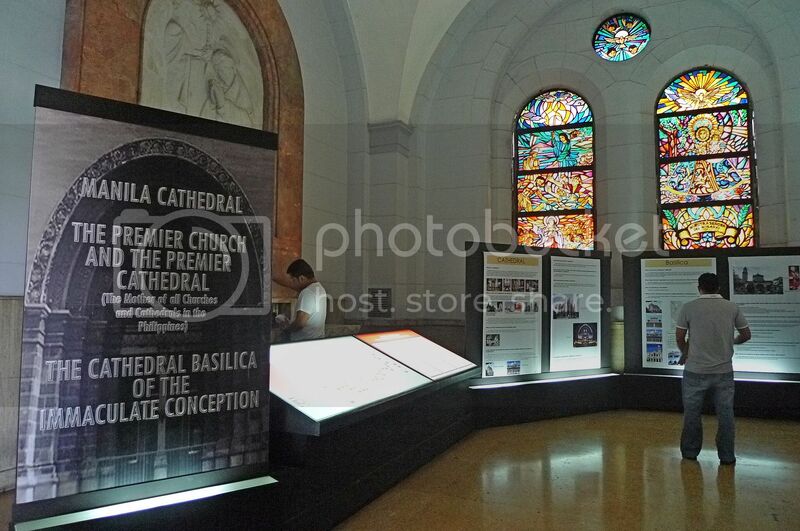 The cathedral also has a crypt below the main altar that houses the remains of past Archbishops of Manila. Along the right and left naves are several chapels which I visited. These are some of the photos I took. Along the right lateral nave of the cathedral, somewhere in the first or second chapel, you can find lots of information about the cathedral and also learn some of the words and terms used by Catholics that most non-Christians are not familiar with. 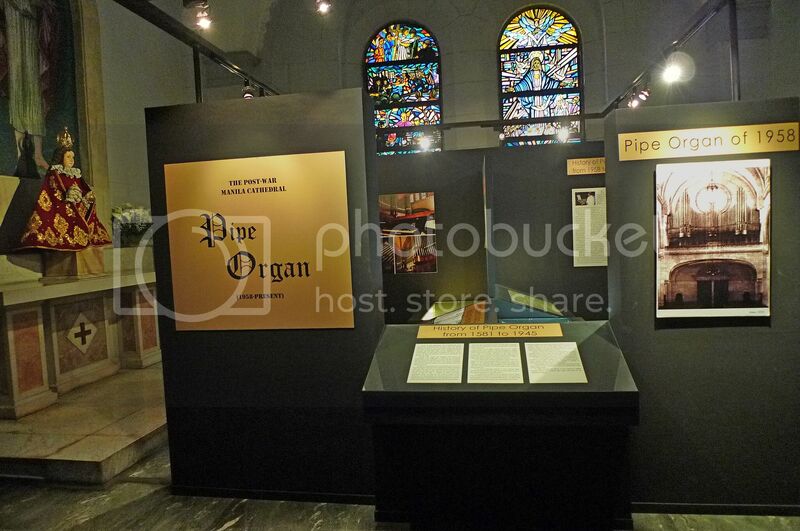 There is a chapel that provides information on the history of pipe organ and how it works. 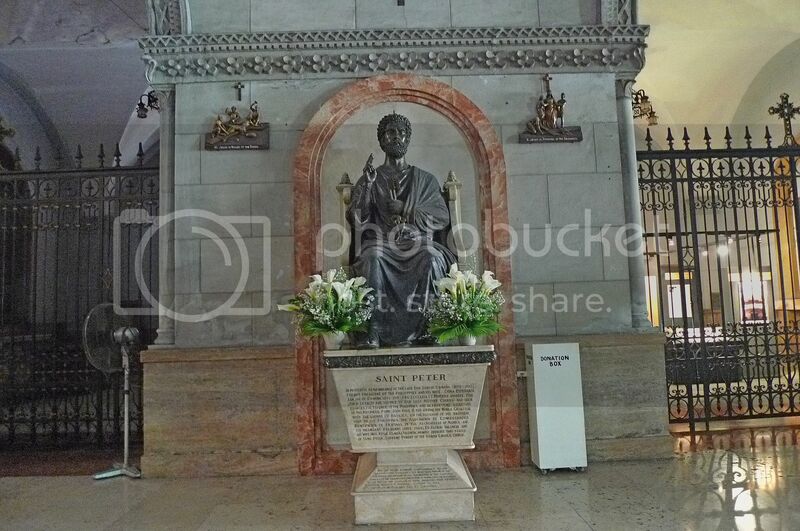 There is this Saint Peter statue along the right nave near to the altar. 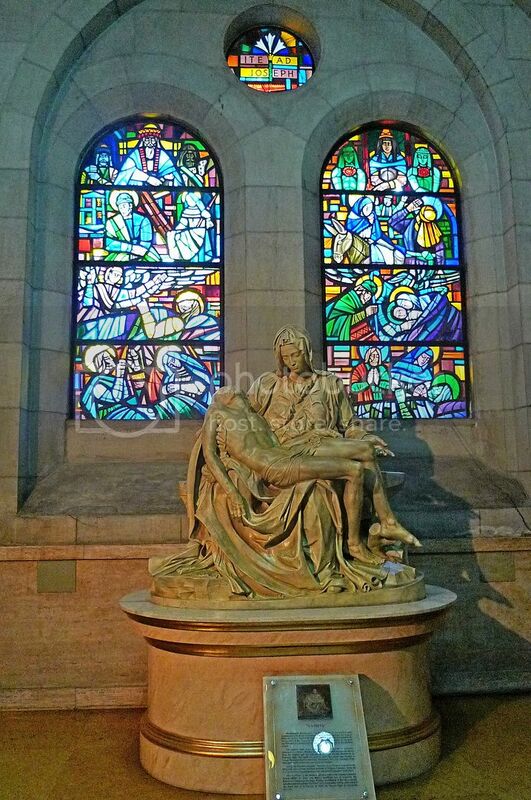 The Chapel of St Peter occasionally serves as a mortuary, where bodies of the dead lie in state until burial. 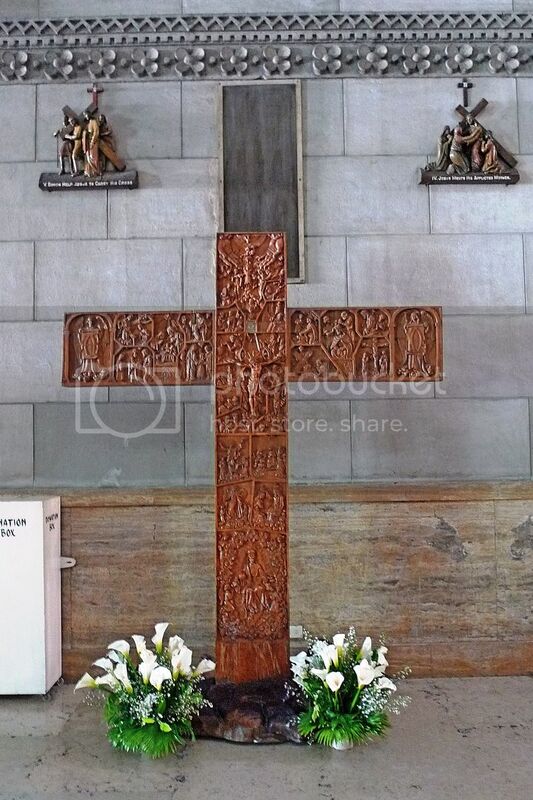 I came across this cross with intricate carvings along the left nave of the cathedral. 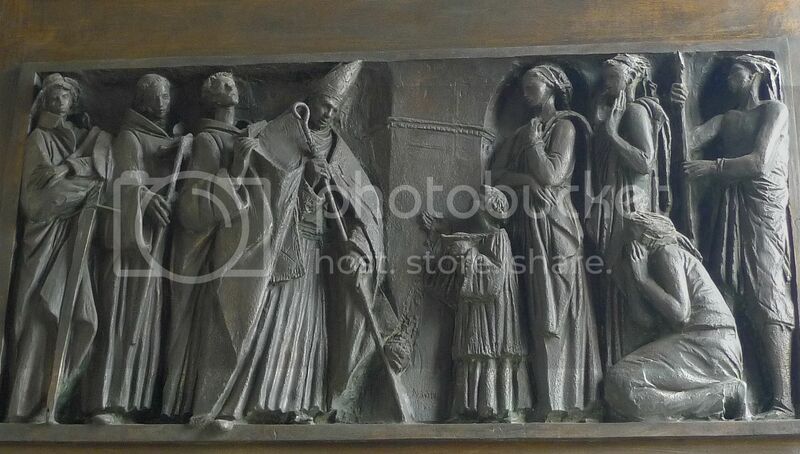 I also saw interesting artistic reliefs on the main door or portal of the cathedral. 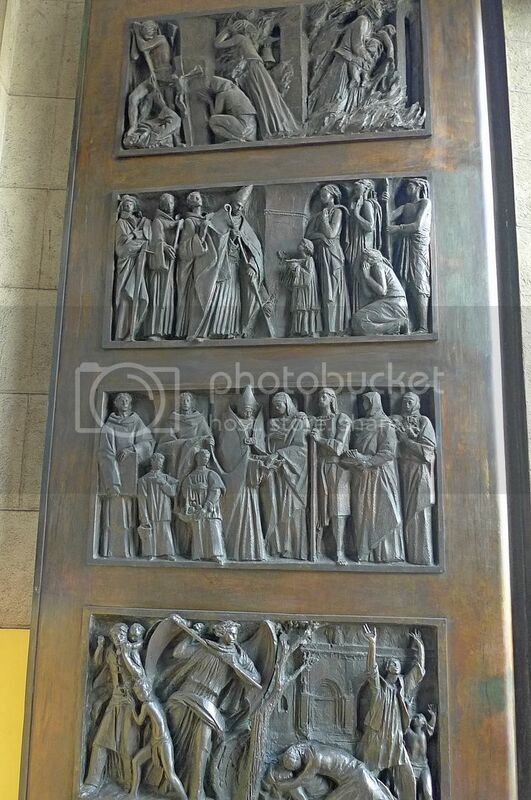 There are eight bronze panels on the main portal. 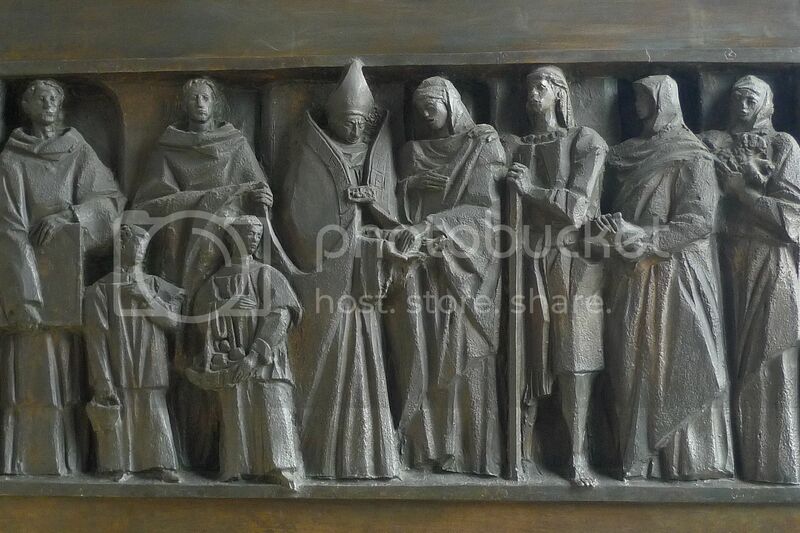 These are among some of the historical depictions carved onto the bronze panels. 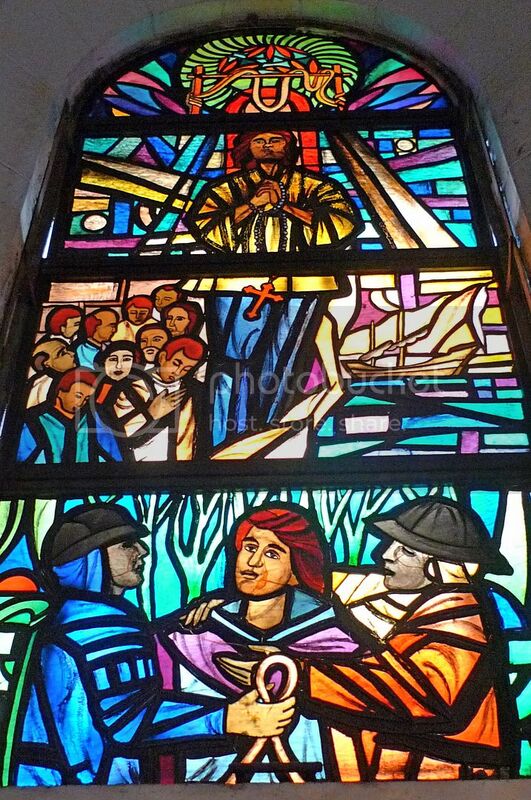 If you notice in some of the photos above, there are beautiful stained glass windows in most of the chapels. 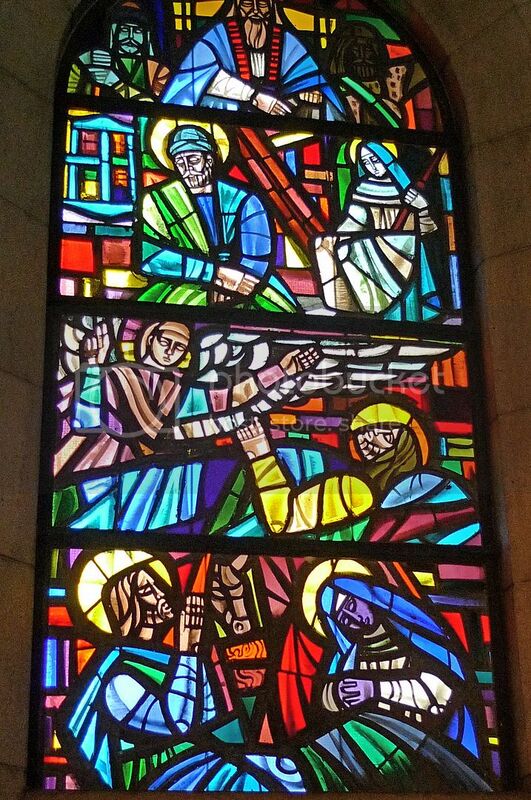 These stained glass windows give pictorial history of Christianity. 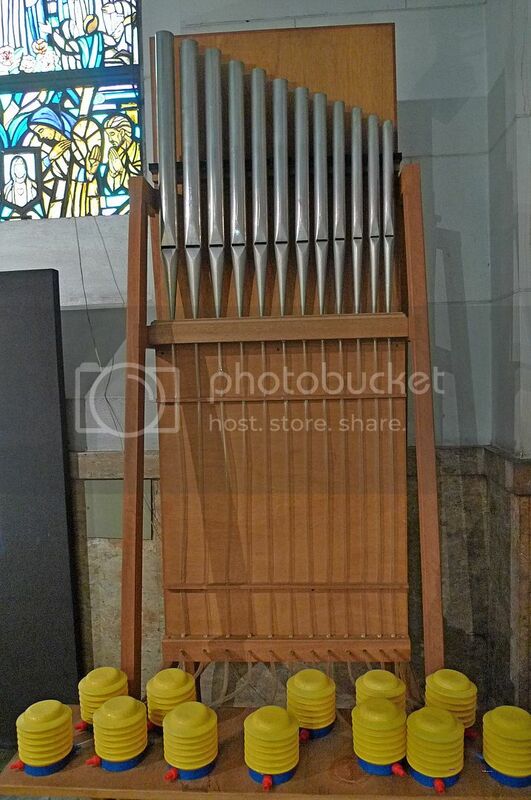 Here are some that I captured on camera. 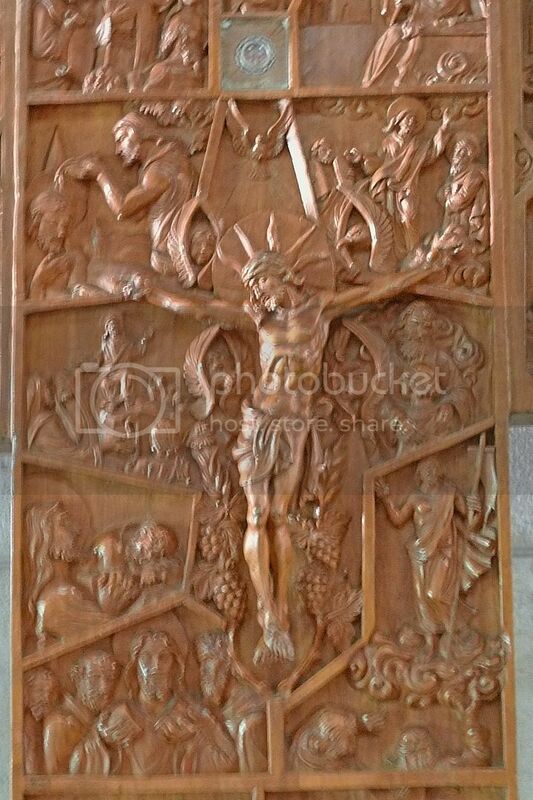 I spent almost an hour inside the Manila Cathedral. 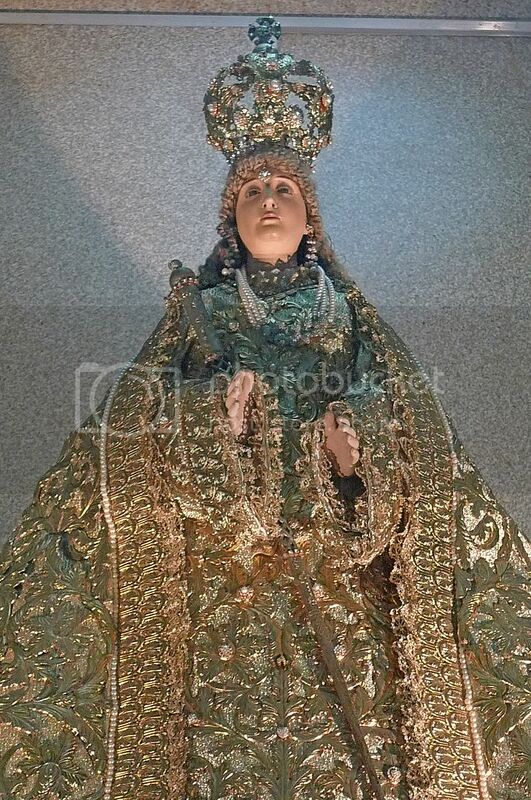 It was an interesting one hour for me being a non Catholic. 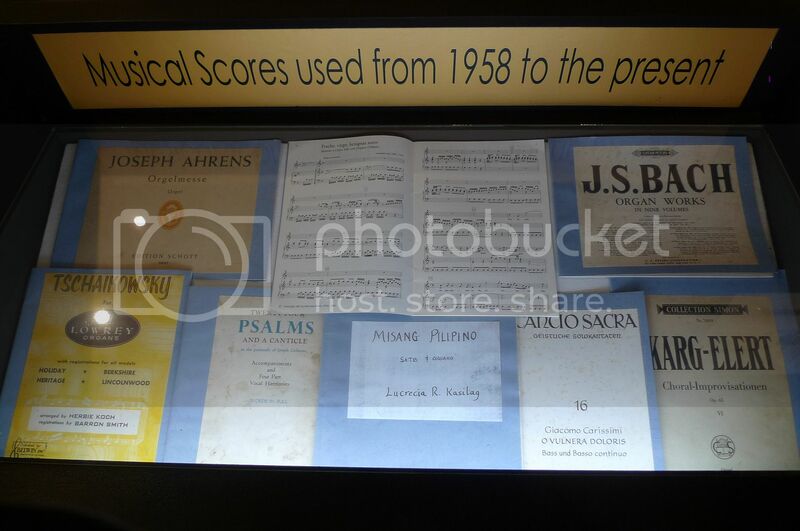 It was time to move on to the next place of interest in Intramuros. As I walked out of the Manila Cathedral, I was wondering if I should get myself a pedicab driver or maybe even a kalesa (horse-drawn carriage). Or perhaps I should just walk since I really like walking. Well, you will know what I did next in my next post, so stay tuned!